I was very blessed on my birthday, the other day, with all of the memories that were gifted to me. Thank you TO ALL who shared with me!! You have NO idea how much it meant. It brought many tears, but I wanted the tears and the memories. And, if anyone else still has a memory to share, please don't hesitate to do so...ever. Just because it is not my birthday doesn't mean that I won't still love them. I want to know every memory of her...and I am obsessively collecting EVERY picture of her. It all helps to keep her alive in my heart. Vienne was such a huge part of our bakery. We fondly remember her coming down with you and/or Mark, sitting on the sofa like a perfect little lady. Hillary came across this photo of her and we think it is really special, and should share it with you. 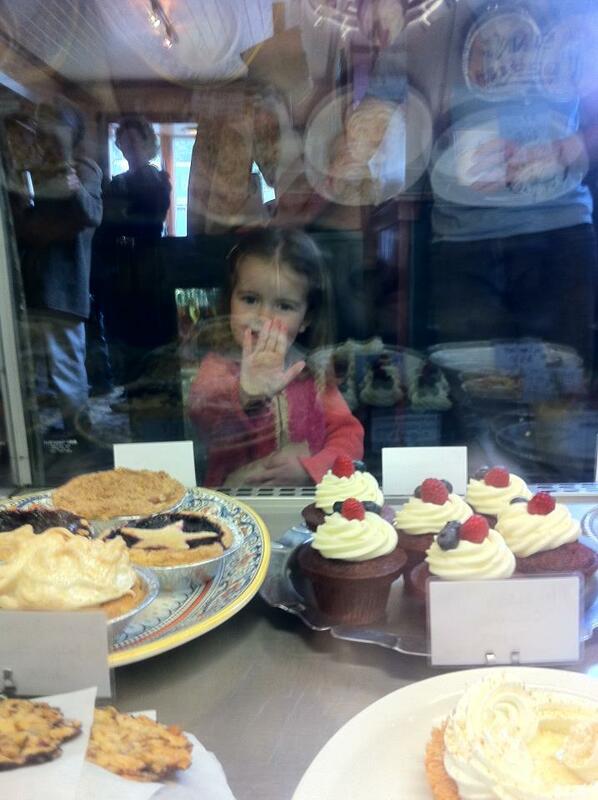 It is from July 4th, a couple of years ago, shot from behind our dessert case. Vienne helped us realize how rewarding children can truly be. Happy Birthday, Jenny. It's funny when I stop to think of a specific memory to share that I have very few to draw from. Facebook has made it so I feel like I really knew Vienne well, despite our lack of true interactions. I remember very simple things: the time you brought her to visit and play with Evelyn when both girls were still too little for a real play date. 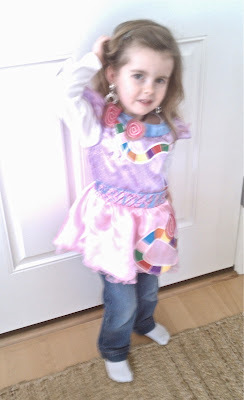 She was learning to walk and was toting around a pretty wooden bead necklace. You danced around my living, nursing her when she got hungry for lack of a giant yoga ball to bounce on. I wish I had more, but I only have one day. Quiet, well-behaved Vienne carefully eating her ice cream at the table while Makayla and Emily ran up and down the path at Enchanted Forest, screaming! She was so calm and mature for her age - I couldn't believe it. There are so many memories. So many. The time we came down for some holiday (Thanksgiving?) and Vienne was in her teal panda outfit with leg warmers and she was rolling around on the floor with her cherubic cheeks and fantastically roly-poly thighs. You dropped down and blew on her belly and she squealed with delight. I have so many visions of you holding her sweet hand, both of you looking like you walked straight out of a magazine. Both so poised and beautiful and "full of life". Together, you were breath-taking. Mother and child, a sight to behold! I remember one of the last Sundays I saw Vienne at church, she was wearing the most adorable sailor pants, her hair in a loose bun. She was crying in the kids' room and I went to her because perhaps you were nursing Ivy or perhaps you were busy. I held her and kissed her sweet cheeks and then she asked for you. I found you and handed her over. You were in a beautiful blouse, your hair looking fantastic (as always!) and you held your darling little girl, and I felt a pang of sadness in my heart that I would never hold a little girl the way you held her. But I felt genuinely happy that I had you both. You, as my dearest friend, and Vienne as my 'niece' whom I could dote over with girly things. I enjoyed those moments with her. And, I look forward to many more in a more perfect place. Happy Birthday, my dearest friend. I look forward to watching you with your sweet Ivy, and enjoying the bond you have with your daughter. Happy Birthday, Jenny! We love you and pray for you all often. We unfortunately only got to visit you and Vienne a couple of times. But it has been a sweet blessing to watch her grow, through the pics on Facebook. You are an amazing mama! I will never forget our couple of visits with Vienne. What a sweet girl! The time we met Vienne we came to visit you in Cannon Beach and we were eating dinner and you had to change her diaper and you held her up and said, "isn't this the cutest lil bum?!". Ha! It was hilarious and cute. 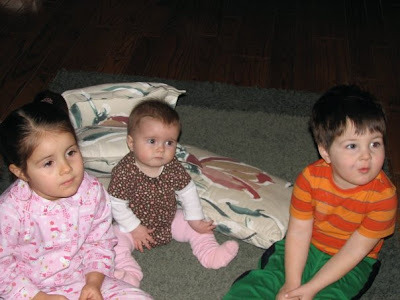 :) We had fun watching Baby Einstein, too. Then, the second time we got to visit all of you, I couldn't believe it had been almost 4 years! Time flies so much! Although, I too never felt like I missed a beat due to all the wonderful pics here on FB. Vienne was so sweet playing trains with Hans and making Ivy laugh so hard during dinner. We think of her often as trains are Hans' favorite thing and the cars from the Cars movie. Such sweet memories. Love you all. Gosh, I have many and even starting to think back makes me cry. I remember the first time we introduced our girls. How excited I was that you were just like me - obsessed and totally enamored with your girl! We oohed and awed over how cute they were together. I remember the way you would talk to her, so kindly and quietly. How gentle you were with her. I remember watching you hold Vienne as we sang Happy Birthday to her [at her 3rd birthday party]. She loved the embrace of her mama. The trip to the zoo where Vienne was in love with the dinosaurs and Emily was scared out of her mind! You were so proud of how brave your girl was but also so sweet to feel badly for mine. I remember watching you at your home while you were potty training Vienne. Again, so patient and encouraging with her. And, as Lacey mentioned, I mostly remember visions of your beauty as you walked hand in hand with your gorgeous and dainty little girl. You two always looked as if you walked out of a magazine - so adorable, so beautiful, and just radiating adoration for each other. It was a sight! I remember so much love, my friend. A memory just came to me...it must've been a year and a half ago in the summer, when we both were over at Lacey's house. I think I was kidless that day! 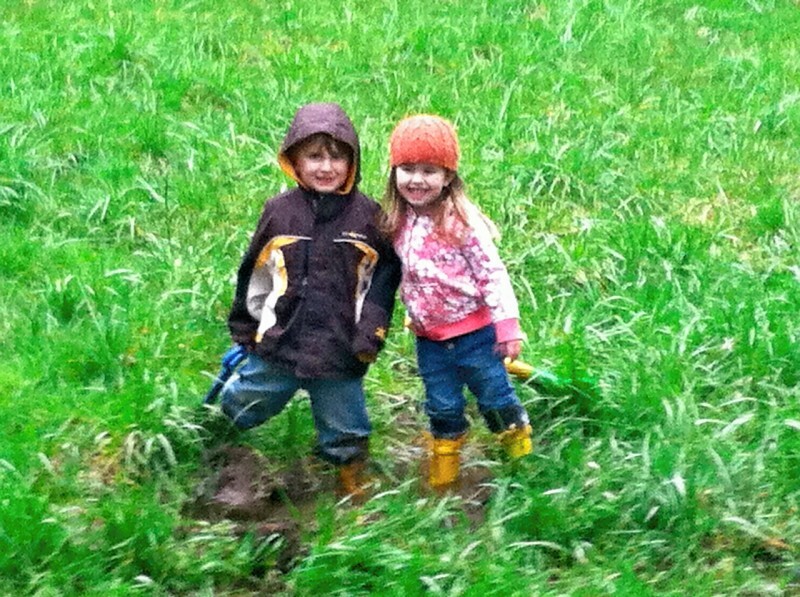 Anyway, I remember Vienne running around and playing with Caleb and Kai, getting totally soaked and muddy, just like one of the boys! We all commented on how adorable she was, with her fantastic combination of dainty tomboy. :) I remember you talking about her with such affection and pride, in the sunshine that morning. I believe she borrowed some clothes from Caleb to go home that day, as hers were totally soaked! Caleb + Vienne = the cutest little friends ever. I remember meeting you, late last summer, at Summerlake Park, walking, playing on the playground, feeding the ducks, and having a little picnic. Vienne was happy and gentle, quiet compared to my children - but then, they tend to be on the loud side. She played so nicely with Bella and was attentive to you and Ivy. She was so polite, asking me for more cracked corn as we fed the ducks from the bridge. When we sat at the table in the grassy area for a snack, she was delicate and precise. You walked Ivy a bit, trying to get her to sleep in the stroller, while Michael, Bella, and Vienne ate and played on the grass with me. It was a beautiful day - sunny but not too warm. I hadn't seen you and the girls much for a while and it was just thoroughly enjoyable. My most strong memory is of her on the 4th of July in 2011, running around with a sword, chasing the Miller's kids who had squirt guns. I think the dads had even more fun than the kids, that afternoon! You were beautiful, pregnant with Ivy. Vienne was shy until the water fight ensued. She was SO sweet to you and Mark. I loved watching you parent her. Every time we saw you with her we could see you deep love for her. She adored you both. I loved watching that video of her dancing/singing with the girl who spent the night when her mom gave birth. That exuberant personality was the same one I saw during the water gun/sword fight. Love you! Happy Birthday, Jenny! Know that I think about you and your family, every day!!! How fortunate were we to be one of the first ones to meet Vienne and to see you and Mark, as new parents. The swinging in her carrier to lull her to sleep when you would come to visit at the office. The price and love....you let her crawl in the dirt and slobber on my watch. The 4th of July parades...playing with the cars in the office...she was so small but oh so bright. Thank you for letting us...me...be a part of her short life. I love you....Happy Birthday. I believe it was your birthday a few years ago that introduced me to the joy of artichokes. Miss V was sitting dainty, trying bites from Uncle Donny and Uncle Adam. Always watching and taking it all in. You were so sure of the things you wanted for your sweet girl and you forged ahead no matter the obstacle (ie: wearing and bouncing her 24/7 for 6 wks straight!). Cheers to a wonderful Mama on her cake day. Love you. One of my favorite memories of you and Vienne was when you brought her over to play in the kiddie pool with Natalie [summer of 2011]. She was a big girl and was all potty trained and when you got here, you brought her super cute bathing suit in and changed her. We were sitting in the living room, Vienne was nakey, and you proudly grabbed her cute little bottom and said, "Doesn't she have the cutest little bum?". Yes, of course she did. She had the cutest EVERYTHING. You are such a wonderful mom, Jenny! Love you, Friend. One of my favorite memories of Vienne was when she was just a tiny little thing. You invited me and Jude over to your house in Cannon Beach and my first thought was that she had the tiniest most precious little feet ever, as I stared at her miniature shoes lined up outside. 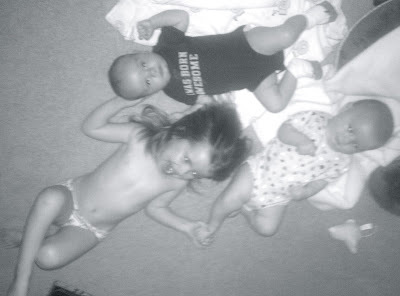 But, I will never forget how sweet she was around tiny baby Jude, encouraging him to look up and play on his tummy. She was the sweetest little "mama" even when she was about a year old. It may sound simple or normal for a Momma, but when I visited last year, when Ivy was born, V came down where my mom and I were sleeping and she snuggled up with me as I was waking up. You talked about how Vienne would always come and have "snuggle time" with you in the mornings, and I thought that was so precious to get the joy of spending that special time with her everyday. She knew just what to do to make you happy. Happy Birthday, Jenny. I have so many memories. A few stand out in my mind, though. I will never forget when V was about 1 1/2. Asher and I met you two for story time at the CB library. V was a little out of sorts because one of the kids kept taking books from her. She started to kind of melt down. You picked her up and walked away. I thought you two had left the library, but when I looked around, I saw you and she in the corner of the library, in your own little world, nursing. She was playing with a strand of your hair and I caught your eye and smiled at you. You gave her just what she needed at that moment and it made an impact on me. I loved that you had no qualms about nursing your 1 1/2 yr. old in a public setting, because she needed that intimacy right then. I also remember that warm day when you two came to visit in Seaside. V charged the ocean with no fear. Asher had just learned to walk. We all literally frolicked in the surf and before long, V had stripped down naked and was running around like she was the only one on the beach. I love that you always made her feel comfortable being who she was. You are such an attentive, caring Mama. Thinking about you today and always. I remember what fun we had at Oaks Park, a couple summers back. Vienne was so brave on the rides. Lyla remembers the handful of times she and Vienne played together. 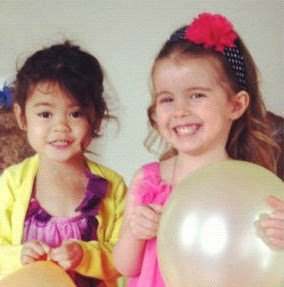 One time recently, she told me that her tears were falling down because Vienne was her best friend and now she is gone. I think it's neat that they only played together a few times but yet V had such an impact on her. I watched Vienne play on the swings, the slides, the rope bridge. She was clearly different from her peers, a marked juxtaposition, speaking volumes to our society and inherent flaws in parenting. While other children screamed and terrorized their playmates, Vienne observed, quietly, peacefully. She exhibited an awareness to poor behavior, years beyond her own age. She was their antithesis, smiling cheerfully and letting other kids go first. 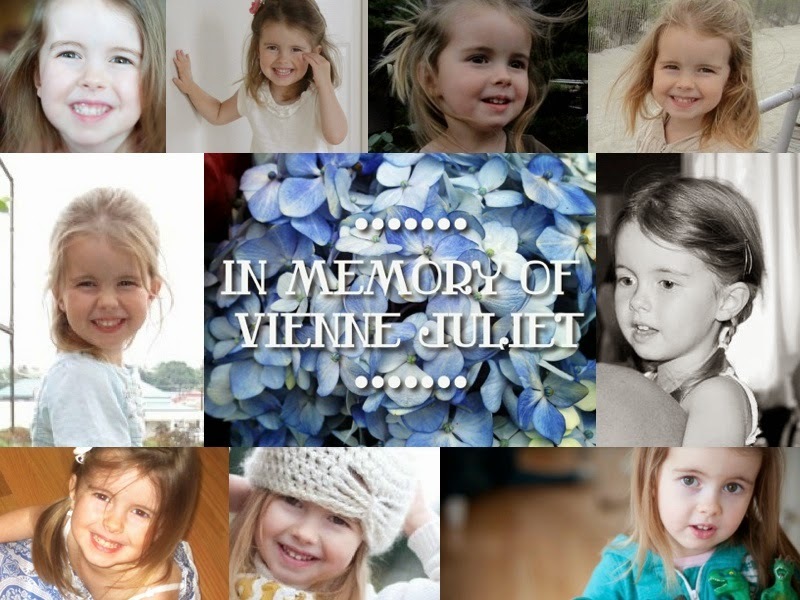 Vienne was an inevitable manifestation of the love and kindness of her family. On that fateful day, I remember succinctly my first thought: "No, not her. We needed her. The world needed her." I remember the first time I met Vienne (at your house for book club). Her beauty and smile struck me as extraordinary. 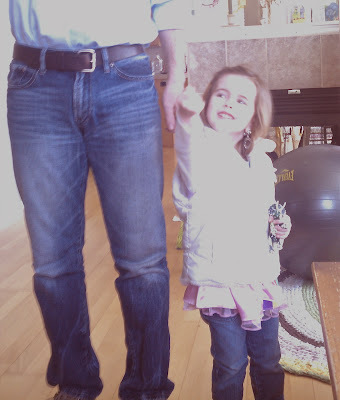 Later, I could hear her joyful giggling as she played with Mark upstairs. It was so apparent how much she was/is cherished by you two. Happy Birthday. I remember asking you, once after a few encounters with Vienne, if she was always so sweet and calm. You just smiled and nodded your head and said "Unbelievably, yes" (as if you were just as astonished as I). "She even turns off the lights when she leaves a room" you shared. From that point on she was on my radar and I never ever saw her get upset of cross with other kids or adults. It still blows me away! I also remember how surprised I was by her bringing her dinosaur to Caleb's birthday party. It just didn't seem to fit in with her beautiful hair and cute fairy costume...but it told me that she was a special kid. Hope your birthday is blessed, Jenny. The memory that came to me today was during last summer. I had come over for a visit with Miriam and we were all (3 cousins and 2 mamas...as it should be) upstairs, while you packed for a trip up to Seattle. I remember that Vienne was a little goofier than usual as you let her go without a nap, so that she would sleep during the drive you were about to make. 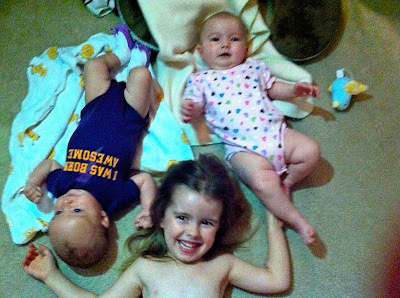 She was rolling on the floor with no clothes on (we have that captured in pics...a rare pic that captures them all together...not great photos but treasured ones). But what I remember more were the clothes she had on earlier that day...a candy land costume dress and jeans and a white puffy vest...the outfit was hilarious (I have a pic of that outfit too, cause it made me laugh) and what I remember was being so impressed in how you would let V wear whatever her fashion sense put together...no matter how silly or crazy it was. You let her express herself in that way...and she loved her crazy outfits! She went to the store that night in that outfit. 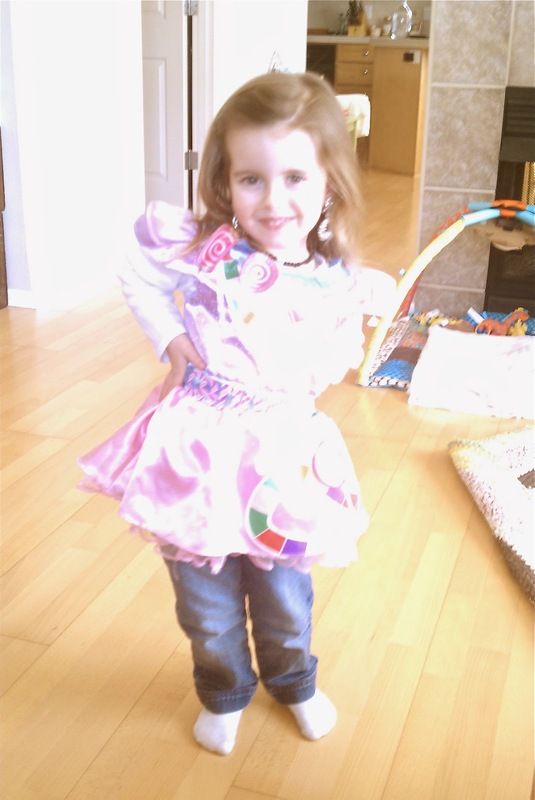 :) I just remember thinking how great of a mom you were in letting her have that freedom and take joy in picking out her own fun attire. That whole day is cemented in my mind, just a simple day with all of our girls together...I miss those. I love you and am so glad we get to see each other almost everyday now and that Ivy and Miri will grow up closely together. I remember when I first started going to the play group when Autumn was about 4 months old and I met you and Vienne. While all of the other kids were off playing loudly in the back, Vienne was usually right by your side, playing sweetly and quietly. One particular morning comes to mind when Autumn was about 6 or 7 months old and I saw Vienne starting to take an interest in her. I was so happy that an older girl was interacting so nicely with my baby! I don't know if you remember but there were blueberries on the table and Vienne saw me feed one to Autumn, so naturally she came right over to help me out! I think she came close to feeding Autumn the entire container! It was sooooo sweet! I just remember the big smile on her face while feeding Autumn and we were all luaghing and talking about what her diaper was going to be like later! I just love that girl and I love you!!! I hope you had a wonderful Birthday, Jenny! I have many but my very first memory of you and V is the first time we really chatted. It was July 2011 and we were both pregnant with our second girls. You and V heard us outside, in our courtyard playing, and walked across the street to say "Hi". I remember how sweet and kind (of course!) Vienne was and that I felt a connection with you right away. The beginning of a beautiful friendship. The other fond memory I have is helping you with V's birthday cake the night before her 4th party. You had baked a gluten free, chocolate, heart-shaped cake and you were decorating it green with purple polka dots, as Vienne requested. The next day, at the party, Ella and I came an hour early (by accident) and Ella and V were so excited running around, playing with balloons. Vienne was breathtaking with her hair curled and wearing a pretty pink dress she had picked out. She ran over to me and showed me her awesome green nail polish on her fingers. I will never forget that party as it was the only birthday I will have celebrated with V.
Happy Birthday. I have a great memory of you and Vienne that I want to share with you. Not sure if you remember it because it was like any old day but it has always stuck with me. Ella and I were out walking Sneaker and you and Vienne were out playing in the courtyard (Ivy was sleeping). Ella was so excited to see Vienne and play but I knew you guys were having some quiet playtime together. So Ella and I finished taking Sneaky to do his thing and then came by for a visit. The two girls went off and played by the water fountain and rocks, both so happy to be around one another and we chatted for awhile while they played. 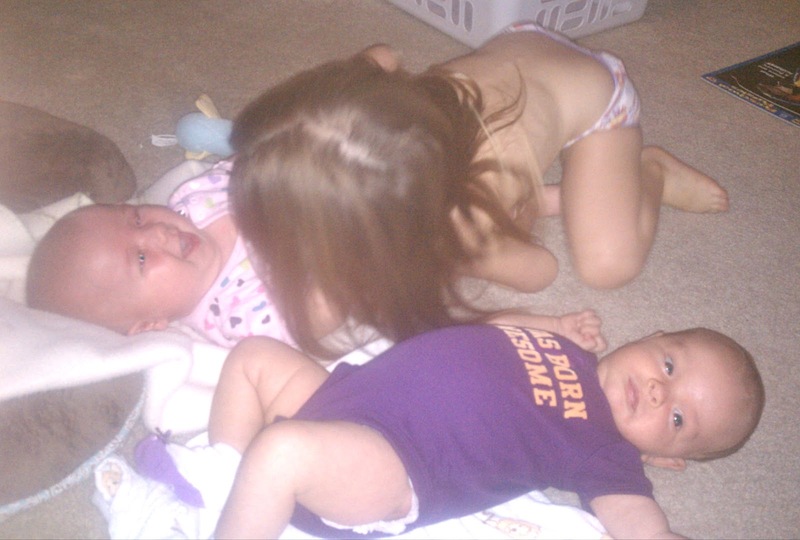 Ella loved every second of being around Vienne and never wanted to leave...and we all know why. She was an amazing light and always made you feel better after being around her. The vision of them trotting along and exploring all while trying not to make too much noise (which they weren't doing too great of a job of!) will always be a part of great memories I hold of Vienne. Praying a joy-filled birthday for you! One of my special memories of Vienne is from when we got on our "kick" (that lasted about a month!) to exercise. Every time she was at my house she turned the boys tool table toy into a wonderful smoothie making machine. Such a sweet girl that modeled loving people well as her mother modeled loving her well! I, just last week, found a box with a handful of random pictures and there was a sweet one of Vienne from Christmas at our house and her bright little face and rosy baby cheeks, and those adorable little legs stuffed into leg warmers. Ellie and Luke were so excited to see their cousin. And Ellie especially still comes to tears unexpectedly, and says she misses her cousin Vienne and how sweet she was. Hi Jenny :) I love your birthday wish. I have a memory too. I think it was when it was just us here with the girls. Anyway, Jane and Vienne were running out of the kitchen and, just before Vienne's little feet made it to the carpet, she fell on her back, hitting her head on the hard kitchen floor. It hurt. In an instant, you were there. You scooped her up into your arms and gently rocked her, reassuring her to "just breathe" as you cradled her head. She didn't cry long, as she was so comforted in your loving and confident embrace. That's all she needed before following speedy Jane up the stairs for more playtime, very carefully with her hand on the wall. :) What a sweetie. I also remember during a playgroup, she came down from upstairs and nuzzled in for a cuddle while you were rocking Ivy in the carseat. :) I think she just needed a recharge of love from you! I don't even think she said anything before she was off again, playing. I was sitting by the fireplace and thought how special it was to catch a glimpse of that tender moment. I wanted to write this and tell you again how, after meeting her for the first time, she climbed in my lap and was drawing you a picture. EVERYTHING to her was her family. She drew all of you. I love how she looked at me when she talked with me. Her smile big the whole time. I am so glad I got to hold your baby girl that day. SHE IS SO PERFECT, JENNY. Well, I didn't know Vienne very well. I only got to hang with the two of you maybe two or three times but I do remember her sweet spirit and patience while we sat and chatted at the cafe...and I remember her beautiful smile. Happy Birthday, Jenny. I know my memories are only from FB but here is one. :) I believe it was for Vienne's 3rd birthday, you posted a video of her inviting people to come to her party. She was too cute, her voice so precious and sweet. I hope your day was special, just as you are special. God bless you. I wanted to share with you the first time I remember you and Vienne. It was at Cori's playgroup and Vienne, I think, was almost 3. I remember her sitting between your legs, on the floor, playing very contently with a toy. You looked so comfortable with motherhood and I remember admiring your relationship! When I saw Vienne she almost always seemed content with whatever she was doing, something that has always stood out to me. It is easy to be envious of such contentment as I think it was a gift given to her by God. Something I know even I strive for each day. Thank you so very much for sharing your journey, even with those of us who are not super close to your family. Please know that we are consistently praying for you and your family. I wish I had MORE memories of Vienne. But I do clearly remember one sunny evening, when we stopped by for dinner on the way home to Wasthington. You kitchen was so cheery, as the sun shone into it. (Shawn still talks about the dressing you made for the salad that night!). I remember Vienne sitting quietly on your lap, as you tried to coax her to eat some fish. You both has such gentle spirits with each other. It was a sweet moment. I really do wish I had more time with Vienne...and with you for that matter. But I do feel blessed by the time I was given and by your willingness to share her with the world. Thank you. Happy Birthday! 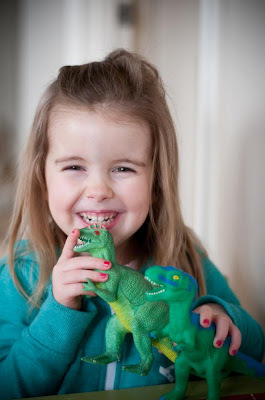 I wanted to share my favorite picture of Vienne...she is holding her dinosaur, wearing a green sweatshirt with her tiny tiny nails painted a red or pink. It's my favorite because I can see in her eyes how happy she is. Also, I can see that Tomboy in her with the girly side too. I never got to get to know Vienne and wish that I did. I remember sitting at the coffee house when you were pregnant and the glow and pep you had in your step about being a mom. I still see it in pictures today, what a proud mom you are. Happy Birthday, Jenny. The first time I met you was when we had book club for the first time at Carolee's house. I remember you would tell so many stories about your daughter, Vienne. I had never met her nor seen a picture so I was just imagining what she looked like by your descriptions and stories - it was such a delightful image! Then, when you hosted book club at your home, I finally met this little angel you talk about so much! Just as I imagined; the sweetest smile, gentle, beautiful sweet girl. The few times we met, I wouldn't really see her (she wouldn't really come downstairs) but after a few weeks I rememer she would come down the stairs and peek at us around the corner until we started discussion for the night. She always had the sweetest little smile on her face and was so curious to see what we were doing! One time I walked in and she was prancing around the hallway on her tiny little barefoot toes, she was SO cute! When she saw me looking at her, she just gave me a HUGE sweet grin and tiptoed up the stairs, looking back at me every so often and smiling. I remember hearing her laughing upstairs or I would hear her little voice singing form her bedroom and we would all giggle when we heard it. What a happy girl! I also remember I would look around your home and admire all of the beautiful things you setup for Vienne - like her little table where she played and her little "kitchen" corner. You put so much detail and attention into making your home so beautiful for your girls. I admired (and still do) how you are as a mommy and often took mental notes of things I wanted to do when I have children of my own! I can truly say through your stories of Vienne and Ivy and in the short time we had together at book club, I learned so much form you about being a Godly mother. I remember the story about "asking Jesus to help her eat her food" when she didn't want to eat. I had never heard this approach before and was in awe! Now that I am pregnant, I still hold lots of pieces of wisdom from your stories of Vienne close to my heart so that I can instill this crazy love for Jesus in my own child's heart. Although I only met her a handful of times, your stories and the way you glow when you talked about her, truly inspired me more than you know! Miss you at book club. Have a blessed birthday, Friend. 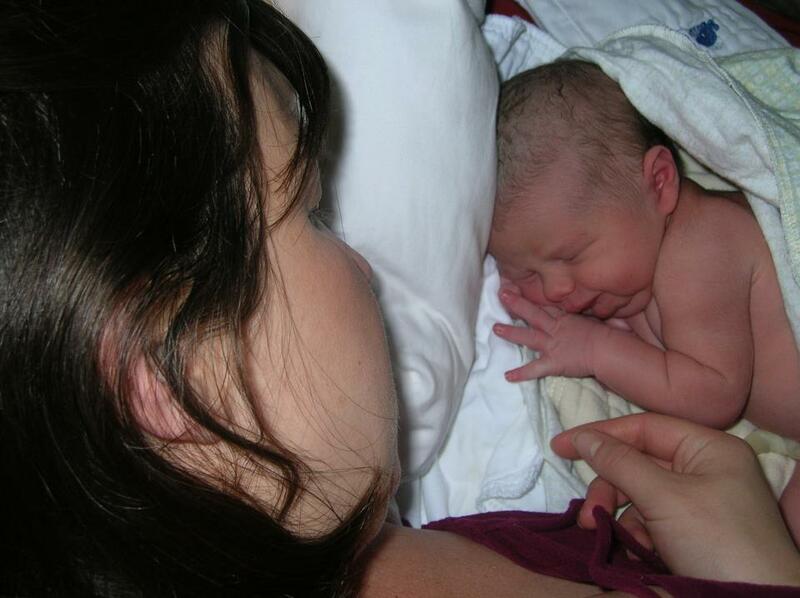 I remember hearing Vienne's birth story and then seeing your pictures. I was so amazed to hear of her perfect and peaceful entrance into the world and then to see the photos -- she was SUCH a beauty, from the first moments! I remember so clearly the photo of her still-attached umbilical cord and thinking (and maybe commenting on the photo) "What a healthy looking cord -- that is one well-nourished baby!" It blessed my home-birthing heart to hear about and see such a poster child. I thought about the Mark Piscitelli I knew back in the Bella Coffee House days and it made me happy to see how blessed he was to have such wonderful ladies in his life. Ben and I see each other once or twice a year, as we've gotten older and moved. Almost 5 years ago (I know Vienne was just a new baby), I picked Ben up in Portland after he'd been to the beach to visit friends there. I asked him how his time had been and he talked about spending time with you guys and other people. This memory is from two summers ago at a "Moms in the Park" play time. We were at Summerlake Park and Vienne and some of the little ones had gone across the field to the baseball diamond. The little ones started heading back and Vienne was calling for you...I don't remember why but you went running to her. I watched you run and I said to myself "that's where Vienne gets her cute run". And, I remember at the very start of our playgroup at Cori's house, Vienne quietly sitting with me as I read a book...It was nice and made me maybe want to have a girl someday. I was just thinking of you and Vienne snuggled up in that hammock at Stephen and Jessica's, during home group at the beach. She must have been only a few months old then and already SO adorable. I remember watching her and thinking how cozy and content she was there with her mama. She is SO missed. I had come to visit with you the summer of 2010 - boy, time has flown by! It was in the afternoon and Vienne had woken up from a nap. You are such a graceful momma. You asked her if she would like to watch a video while you visited with your friend. She shyly nodded her head yes and she picked VeggieTales. She was teething and I remember you let her have direct access to teething tablets. A laid back momma! She took a while to warm up to me but didn't talk much cause she was not feeling well. Then it came time for Mark to come home and me to go. I loved watching the excitement in Vienne as she welcomed Mark home. She met him on the porch and gave him snuggles and hugs. I remember thinking I couldn't wait til I had a family and could witness this scene for myself. That is my memory. The thing is I was a bit jealous, but more in love with your little family...and still am in love with you guys. How can I forget the birth of my first granddaughter on May 1st, nearly 5 years ago...on this, the anniversary of the birth of my first daughter? We received a call in the early morning hours (1am or so) that labor had begun. Of course, we figured we had plenty of time to continue sleeping and get down to the coast early morning to see the birth. I picked up Katy bright and early and we arrived in Cannon Beach about 7:30am. As we walking in the door, Mark exclaimed "It's a GIRL!". No way! We missed it?! Yes. Jenny's labor was smooth and swift. Sweet Vienne Juliet was here, birthed in water, beautiful, perfect in every way. Katy and I spend a good part of the day all over her taking pictures. How thankful I am for my girls...each one. These memories are truly amazing...so many articulated so beautifully. What awesome friends you have, Jenny & Mark, to respond to this request so quickly and sweetly. Truly, this brought back many memories for me. As I read through each one, many with tears, I could see her, hear her, feel her, just as they were describing her and my longing for her intensified as I pondered on these through the night hours, unable to sleep, heart aching. "Brent" made a final comment that continues to shout in my head: "On that fateful day, I remember succinctly my first thought: "No, not her. We needed her. The world needed her." I miss her so intensely. Every morning, she is the first thing on my mind. I lay in bed, remembering the times she spent the night here. In the morning she would stand outside our door in the hall and quietly say "grammy, my green light is on!" 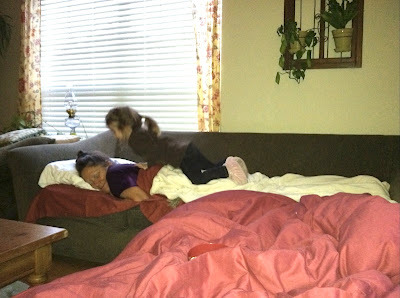 (which meant she could now get out of bed) She was so respectful...always. So polite. I have many memories of her saying "excuse me..." and "may I please". 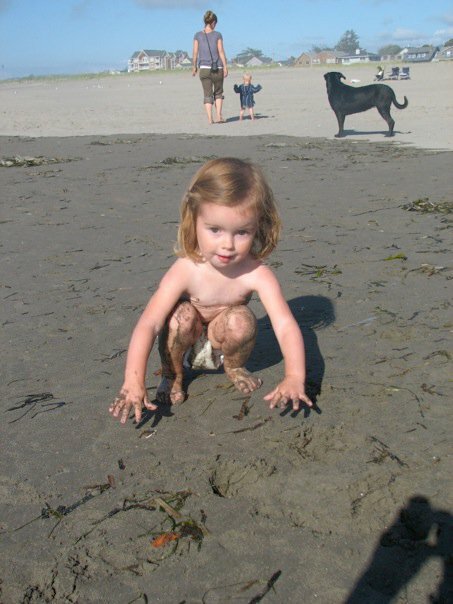 And yes, I would look at you, Jenny, and just be amazed at what an unusual child she was. And here...all these sweet memories...once again confirm over and over that it wasn't just us, her family that saw it. Everyone that came in contact with her for any length of time, saw it. God blessed our lives for 4 1/2 short years with the privilege of having Vienne to love on and be loved by...to be an example of Christ-like love and selflessness. In the midst of my grief, I come so short of that lately. I pray I will be able to honor Vienne (& my Lord) in loving and trusting Jesus the way she did...once again. I miss you, my darling girl.